Nowadays, many people uses Huawei HSDPA modems for connecting to the internet. Among huawei modems, E220 modem is very popular modem in the world since E220 have an internal antenna. However, sometimes when you install E220 modem on Windows Vista or 7 64bit, the modem doesn't detect by the system due to incompatible drivers. It's very difficult to install drivers on those kinds of systems. Therefore, I found a trick to install drivers on Windows Vista or 7 which can be used to detect E220 modem on your PC or laptop. First, download the Huawei E220 driver from the link below and extract it into a folder. Take your pen drive and copy that folder into the pen drive and remove the pen drive from USB. Now, connect the E220 modem to the USB port and again insert pen drive to another USB port. 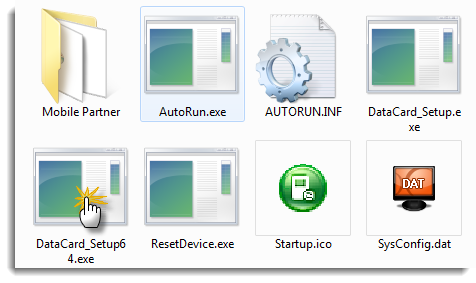 Go to the Huawei driver folder inside the pen drive and double click on the DataCard_Setup64.exe file (if your PC's operating system is 64 bit, otherwise double click on DataCard_Setup.exe). 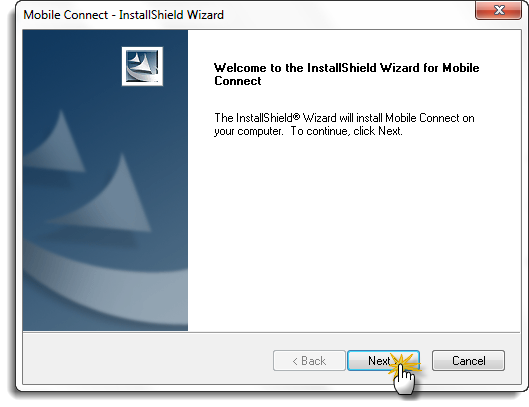 It will open a window to install mobile partner so install the application to the PC. After install the application, remove the modem from USB and re-connect again and go to the device manager. Remove any USB device which connects to USB ports (Remove the Pen drive) except the E220 modem. 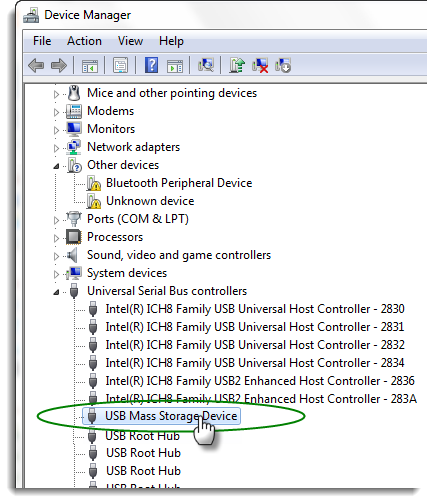 In the Device Manager, double click on the Universal Serial Bus Controllers. Here you can see USB Mass Storage Device as shown in figure below. 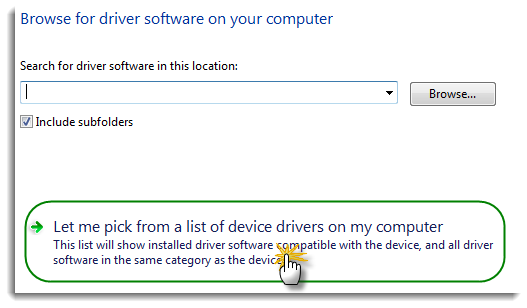 Now, click on "Let me pick a list of device driver on my computer" for manually installing the driver and click Next to continue. Here, it is required to click on the the (Standard USB Host Controller) in the left side under the Manufacturer. Hence, you can see in the right side under the Model, there is a model called USB Composite Device. 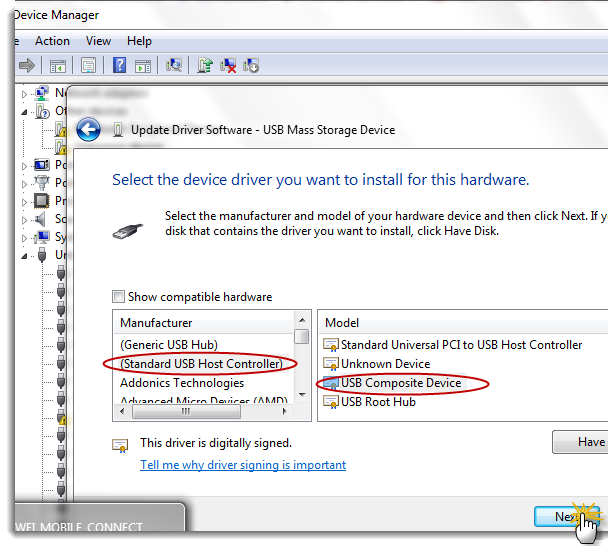 Click on this USB Composite Device and click Next to continue. Hence, it will install the drivers to the PC. During this installation, a message pop up in the taskbar as shown in the figure below. Click on that message to see details of drivers which was installed. It should open the details of the drivers. You can see there are some new drivers added. Now, your device is ready for use in Windows 64bit system. 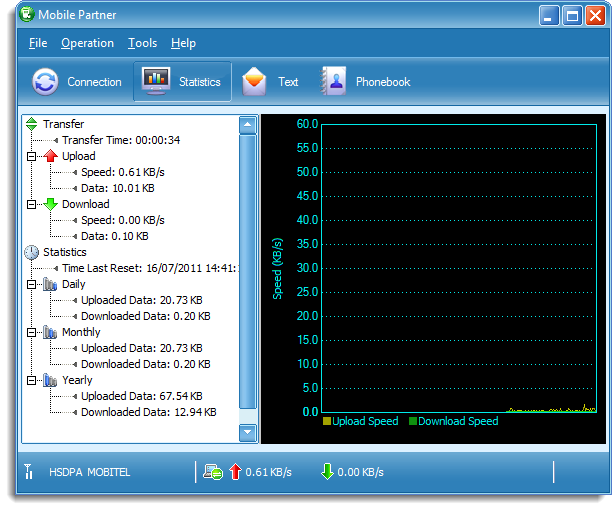 Reconnect the modem to the USB and run the mobile partner. It will detect your modem successfully. Fan-Freekin-tastic post - Keep it up. The only software I could get that actually loaded the 64-bit software on Windows 7 64-bit. Thanks. Also, its user interface is better than the original. Great, thank you very much. I have tried lots of solutions but this is the only that really works. Brilliant - thank you so much for this post, clear concise and unlike a lot of others - IT WORKS !! Brilliant guide, worked perfectly for T-Mobile in the UK. Thanks. Worked perfectly for M1 Singapore, thx. Worked for Win7 64bit. Thanks!!! Be very wary of what you're downloading. If you get redirected to clicksor.com, and that asks you to download an EXE - do NOT download it. Clicksor has a big red flag at WebofTrust. The file that needs to be downloaded is a .RAR. I dread to think how many people have been served a malicious EXE by that site, and run it, thinking it's the driver for their E220. Your solution seems to work. Mobile Partner recognized the modem but now i am getting this message "Error 628: The connection was terminated by the remote computer before it could be completed". Is there anything i am missing? I think your Network operator had a problem. Check your sim card has credits. The ling for download is not working! Tnx Nishantha, you saved me a lot of truoble :)Regards from Serbia ! Thank You. Your write-up helped me. What about an Huawei E220 with Windows8? Will it work? Is there any trick or similar to make it work properly? Brilliant! Thanks so much... I've been sweating all the time for this stupid thing. Your instructions here are marvelous. Thanks again. I will share this to my friends. Awesome! hi Nishantha Bulumulla, me again .. manage to work but still can't eject. Do you have steps to eject E220 huawei successfully? Check whether your device is used some other application on your PC. I will definitely be trying this. Is there a problem with the driver download link, as I only get a blank screen ?